Lenovo's results include Fujitsu's units starting in 2Q18 to reflect the joint venture that closed in May 2018. HP Inc. had its third consecutive quarter of year-over-year PC shipment growth. HP Inc. maintained steady growth across all regions, except the U.S. In the other regions, its shipment growth well exceeded the regional averages. Lenovo experienced its highest growth rate since the first quarter of 2015. In the U.S. PC market, the industry returned to growth after six consecutive quarters of shipment declines. 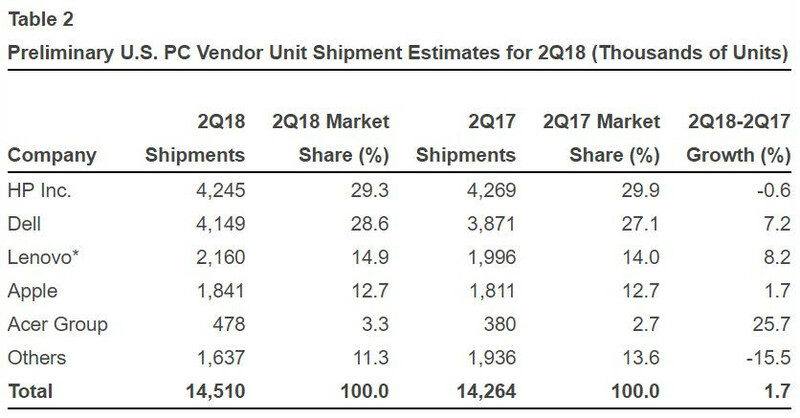 In the second quarter of 2018, U.S. PC shipments totaled 14.5 million units, a 1.7 percent increase from the same period last year (see Table 2). HP Inc. continued to be the market leader in the U.S., but Dell closed the gap, as Dell's U.S. PC shipments increased 7.2 percent. "In the U.S., business PC demand was particularly strong among the public sector as the second quarter is typically PC buying season among government and education buyers," Ms. Kitagawa said. "Desk-based PC growth was attributed to continued high usage of desk-based PCs in the U.S. public sectors. Mobile PCs grew in the U.S., but strong Chromebook demand in the education market adversely affected PC growth. Overall, Chromebooks grew 8 percent in the U.S., but Chromebooks are not included in the PC market statistics." PC shipments in EMEA reached 17.4 million units in the second quarter of 2018, a 1.3 percent increase year over year. In Western Europe, demand was strong for business PCs in Germany and the U.K. Eurasia, which includes Russia, remained the growth region in EMEA. While the second quarter is usually a slower quarter in terms of PC demand, several countries, such as Russia, Ukraine and Kazakhstan, continued to see increasing consumer demand. PC shipments in Asia/Pacific totaled 21.3 million units, a 0.1 percent increase from the second quarter of 2017. India, Indonesia, Thailand and other emerging markets in Asia showed improvement in the commercial segment due to demand for replacing aging PCs and upgrading to Windows 10. In China, PC shipments declined 3.6 percent year over year as some business procurements have been postponed to 2019, and the consumer market is saturated. thank AMD for that Gartner... if it wasn't for their comeback & shaking up Intel's trees, there won't be any growth in global PC shipments or sales. To sweeten the deal, AMD even slashed prices on all their CPU lineup on top of an already affordable mobos for the masses to build their own PC or buying a complete pre-built one. Pre-build shipments that's far from being any indicator about PC health. Amen to that. I always laughed at those prebuilt statistics. Yeah, considering that many PC shops build their own rigs and sell them to the public. Honestly, the only valid information would be laptop shipments. smart phones damage both camera sales and PC sales.. people are trading convenience for quality.. no way could could i swap a PC or a camera for smart phone "convenience" but it seems a lot people can.. Sadly, most people prefer convenience over quality. *wich was driven by the fact that pre builts with mining gpus were way cheaper than the gpu prices, so miners started buying loads of pre builts. Ryzen is irrelevant to these stats. Look at steamstats and tell me how many use Ryzen. Read the 2nd comment please. i never said that sales increased just because people bought Ryzen cpus but release of Ryzen and Threadripper forced Intel to make huge price reductions or people got much more horsepower for same money, for example 6 cores-12threads became mainstream . In fact, thanks to Ryzen, Intel too sold more cpus. I think you still didnt get that part about this being pre builts stats. This has nothing to do with intel or amd. Oh and amazon best selling cpu is i7 8700k followed by i5 8400 as I just checked and 7% of steam users are with Ryzen according to steamstats so Im not sure what your point is tbh. Sales have increased? Thanks, RGB! That’s actually what is most likely behind the increase, unfortunately for some. Steam is irrelevant to make any claims about whether Ryzen was or wasn’t a factor. Steam users are a minority of the pc world. The way I see it, there are quite a bit of older system's PSU failing. Nothing conspiratorial, just experience with PSUs failing 1 year after their 5 year warranty expires. Think about it. Some smartphone cameras is not that bad for simple shots but think of carrying around 6+lb of camera equipment. When ever I go to an airshow, I carry a Nikon d750 and 3 lens for about 8lb of equipment and batteries. I'm not paid for it or work for some photography studio, I like taking pictures of airplanes. There are several things attributable but I think the most significant one is that we are entering a time (+5~7 years) where people start replacing their Sandy and Ivy bridge systems. Those are running into hardware problem era right about now and have been great sellers in the past. So that's a 'wave' kind of thing that comes on top of the current healthy landscape of competition and increased core counts. i kind of compromise.. i bought a ton of panasonic M4/3 gear to keep the weight down but ever since i bought a panasonic FZ1000 all in one camera i have never used it.. the FX1000 is just better than it should be.. not exactly small but smaller than a suitcase full of lenses..
Those seem to be small camera, the nikon d750 is a full frame camera. true but not as small as a phone camera.. size is a relative thing.. the snag is the bigger the sensor the bigger the glass.. the fZ1000 has a one inch sensor i would call it an outdoor camera.. in reasonable light it does a remarkable job for the size of its sensor.. its all a compromise between one thing or another..
my drone (which is really a flying camera) also uses a one inch sensor.. not much good for taking pictures of airplanes though it wont let you take off within five miles of an airport.. he he.. It's also likely that this coincided with the refresh cycles in many businesses. They are longer and longer lately, since for smaller businesses a PC is able to do the job for longer than the usual 4 years. So 6 years might be exactly how long it took them to upgrade from the previous cycle, boosted of course by AMDs recent performance that pulled the prices down. I want to get a drone. I want to use it around the ocean when I learn to sail. You also might have a factor there as well. We just upgraded hundreds of computers that were 10 years old. the thing is the average business PC dosnt need that much compute power and there really isnt much need to upgrade it.. six to ten years seems about right and then most of them hit the ebay refurb market.. there is also a trend for ex office machines to get fitted with a 1050tI gpu and new case and get sold as gaming machines..